Timkat, Ethiopia, 2010. Image courtesy of Terje Oestigaard. The River Nile has long been a subject of study and veneration. From the earliest times the Nile has presented problems upon which men have speculated. Two of the most important which have been discussed since the time of Herodotus, the position of the sources of the Nile and the origin of its annual flood, were solved during the last and at the beginning of the present century. While these questions were geographical in the nineteenth century, in the preceding centuries and even millennia they were also religious quests, and the religious dimensions are still fundamental. This article will discuss and compare the qualities of the divine waters in the different water cosmologies at the source of the Blue Nile in Ethiopia and at the source of the White Nile in Uganda. Based on empirical fieldworks and participation in rituals, it will also enable theoretical discussions of the role and function of holy water and how various water cosmologies work in broader cultural and societal contexts, and the relation between river and rain ideologies in different hydrological environments. Gish Abay, or the source of the Blue Nile in Ethiopia, is seen as the direct outflow of the River Gihon from Paradise. The source is considered to be exceedingly holy and to have a direct link to heaven, which needs to be protected from defilement. 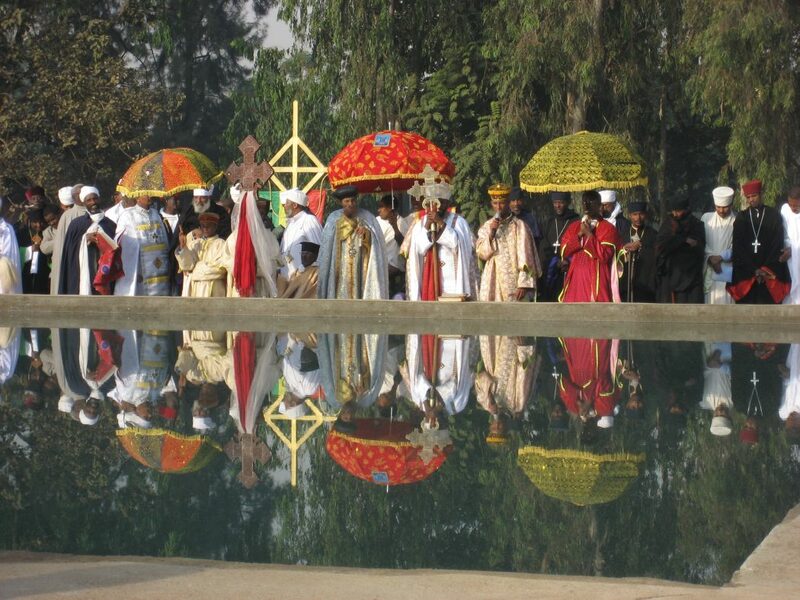 In practice, this excludes everyone except the devotees belonging to the Ethiopian Orthodox Church. The historic source of the White Nile in Uganda, on the other hand, has a very different character. The water is not holy, but the forces of the waterfalls testify to the powers the river spirits possess. These river spirits embody particular healers who can solve anything and everything in this and the otherworldly spheres. Since different forms of religious waters can be holy, sacred, and neutral, it is the differences and changing divine powers and consequences that are central in the different water cosmologies, as well as how they have different religious origins or sources defining ritual uses among humans. Hydrologically, a source is the remotest spring or discharge point of a river in terms of ultimate length. Historically, there are sources found in the history of ideas or places where specific historic significance has been ascribed. Religiously, a source can originate at any place along the river’s course, but most often it is a fountain, a waterfall, or some subterranean source, which may also be a link in one way or another to flows of cosmos in the celestial realms. 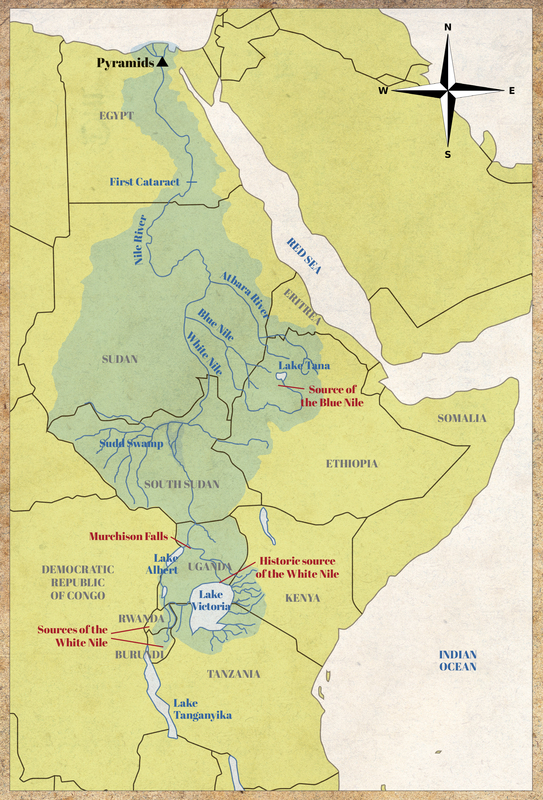 Hence, these different types of sources may not coincide, although the source of the Blue Nile in Ethiopia is both a hydrological source (giving the Blue Nile its longest length), a historic source (being a legendary place visited by explorers throughout the centuries), and a religious source (coming from paradise). 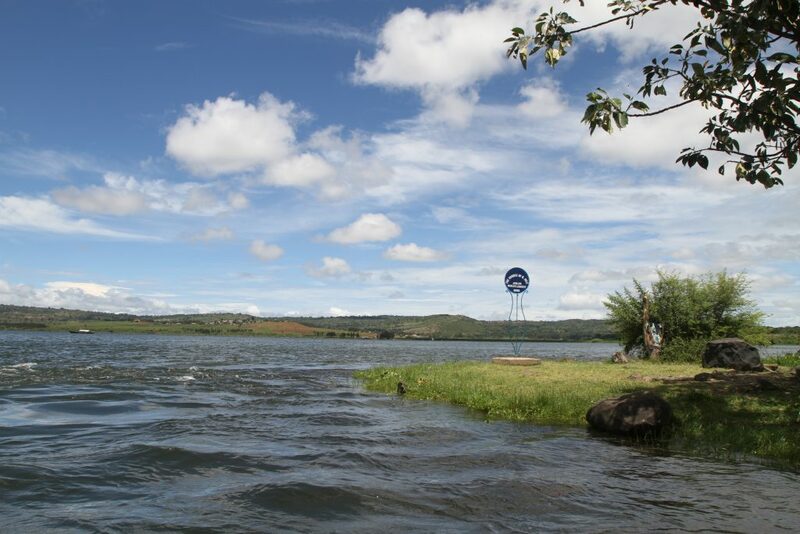 The source of the White Nile, on the other hand, is primarily the outlet of Lake Victoria and hence a historic source, but it is also a hydrological and religious source in the local cosmology. Lastly, the ultimate sources are the rains falling from the sky directing the attention to the divinities and rainmaking practices (Fig. 1). Fig. 1. Map of the religious Nile. Made by Henrik Alfredsson, the Nordic Africa Institute, Uppsala. Used with permission. Oxford Dictionaries define a paradox as “a seemingly absurd or contradictory statement or proposition which when investigated may prove to be well founded or true.” Water in general and religious water in particular may fit well with such a definition, since water is a unique element in the sense that it is always both universal and particular at the same time. By comparing religious belief systems associated with the specific waters at these sources—the sources of the Blue and the White Nile, but also the sources in heaven as rain—the aim of this article is to shed new light on how and why various forms of religious waters shape beliefs and rituals. It will also address seeming paradoxes of religious waters, including why it is ritually and religiously acceptable to pollute holy water and why water may have a greater importance in indigenous traditions and cosmologies when it is not holy compared to world religions’ consecrated or holy water in rituals and devotional practices. Being the source directly from heaven, the water is exceedingly holy, and Gish Abay is believed to be the source of both secular and spiritual life (Fig. 2). It is generally believed that people who are baptized or sprinkled with water from the Gihon River are cured of sins, sicknesses, and misfortunes. On behalf of Abune Zerabruk, it is also believed that God bestowed his mercy on up to 70 generations of the descendants of the devotees who made a pilgrimage to the source, prayed, and used the water in rituals. Fig. 2. Gish Abay or the Source of the Blue Nile in Ethiopia. Image courtesy of Terje Oestigaard. If this source is today seen as the holiest of the holy water since it comes from Paradise, it was anything but a heavenly haven in the past. The first European to visit and document the source of the Blue Nile was the Portuguese Jesuit priest Pedro Paez. The date of his visit is variously given as April 21, 1613 or 1615 or 1618. When James Bruce came to the source in November 1770, he referred in particular to the cult of sacrificing oxen: “The Agows of Damot pay divine honour to the Nile; they worship the river, and thousands of cattle have been offered, and still are offered, to the spirit supposed to reside at its source … all the tribes … meet annually at the source of the river, to which they sacrifice, calling it by the name of the God of Peace.” At the time of Bruce’s visit, the church had established itself at Gish, but the pre-Christian practices and traditions were still alive and present, and it seems that Christianity incorporated what they called “pagan practices” and re-interpreted them in a cosmology fitting the Biblical world and the Bible: the River Gihon coming from Paradise. Postcolonial criticism of these Western explorers is important. “It seems absurd to continue to credit European explorers with the ‘discovery’ of African peoples, rivers, lakes, waterfalls, mountains, and creeks,” Nwauwa says, “when Africans themselves knew about the existence of these things.” However, in particular with regard to the source of the White Nile, Western explorers like Speke established religious connections along the Nile’s flow of water and without external interventions and interpretations the local traditions would not have become part of Christianity or world religions. 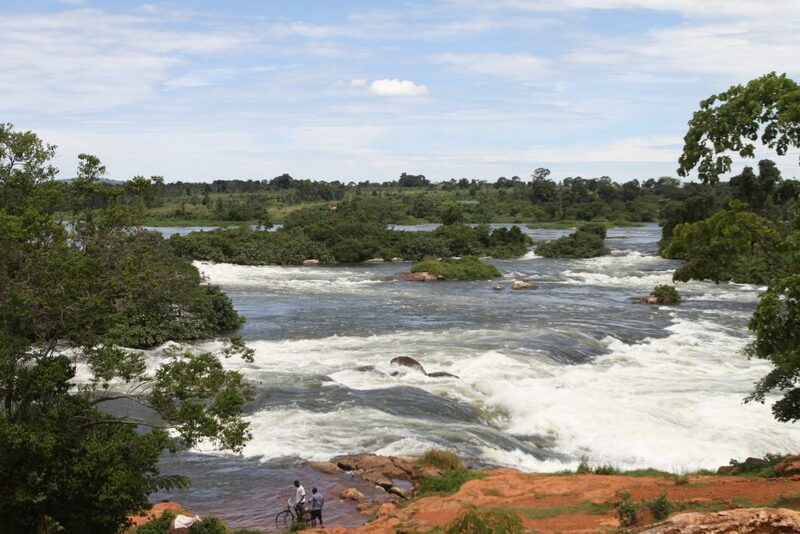 One hundred fifty years later, a Catholic priest in Uganda made the connection between the source and Christianity’s salvation history even stronger: The River Nile is a history of salvation in Christianity. Moses and all the other Biblical figures like Abraham and Jacob drank of the waters from the Nile, including Jesus with his family. Uganda in general and Busoga in particular have therefore a special role in Christianity and the salvation history. The Nile connects the religious beliefs since, without the waters from Lake Victoria and the historic source of the White Nile identified by Speke, the Biblical history could not have evolved and unfolded in Egypt as it did. Nevertheless, priests emphasized that the water at the source in particular or the Nile in general is not holy. Moreover, while Christianity first came to Uganda in 1877, the traditional water cosmology in the Busoga kingdom was structured around the actual source, which Speke did not see when he was there, and the successive waterfalls Bujagali and Itanda, respectively 8 and 30 kilometers north and downstream of the outlet of Lake Victoria. There are innumerable spirits and divinities along the course of the Nile and its lakes in Uganda, and they are in particular living in waterfalls. Among the Busoga, the water in the falls is not holy—in fact, no water is holy—but the waterfalls are the true testament of the spirits’ powers. The cascading thunders are testimonies of the powers the river spirits living there possess; the more raw and brutal water-powers are in nature, the stronger the river-gods are believed to be. Fig. 3. The Source of the White Nile in Uganda and the river spirit Kiyira. Image courtesy of Terje Oestigaard. At the historic source at the outlet of Lake Victoria (Fig. 3), there is a subterranean source in the middle of the river creating a counter-current seemingly rising from the Ripon and Owen Falls. According to those still believing in the traditional Busoga cosmology, this unnatural or supernatural phenomenon was a testimony to the force of the river spirit Kiyira. The most powerful spirit was living in the next waterfalls, the Budhagaali spirit in the Bujagali Falls. The force and sound of the Bujagali Falls give testimony to the powers of the Budhagaali spirit and it is truly a river spirit. Still, it moves freely around on land and wherever it wants; after all, gods are gods, spirits are spirits, and humans are humans; but unlike transcendental gods like God or Allah who ”live everywhere,” the Budhagaali spirit has its “home” in water. And although he too is “almighty” in his local context, this is not because the water is holy as such, but because he is a powerful spirit. The forces of the waterfalls prove the power of the spirits, but the spirits’ powers are not dependent upon physical materialization, since spirits are spirits. In the next and the slightly smaller waterfall, the Itanda or Kalagala Falls, reside yet another pantheon of innumerable spirits, of which Itanda is the most powerful. The mighty rain and thunder-god Mesoké also lives here (Fig. 4). Fig. 4. Itanda waterfalls. Image courtesy of Terje Oestigaard. Based on the natural forces as they are manifested in the powerful waters, the hierarchy of the water and river gods is: Budhaagali, Kiyria, and Itanda. In some mythologies, Budhagaali is seen as the father of the two others, who are like brothers. These spirits or gods have chosen one particular earthly representative or medium each—a healer who is an intermediary between humans and gods. In 2017, these representatives—Jaja Bujagali, Jaja Kiyria, and Mary Itanda—were respectively 100, 44, and 47 years old. 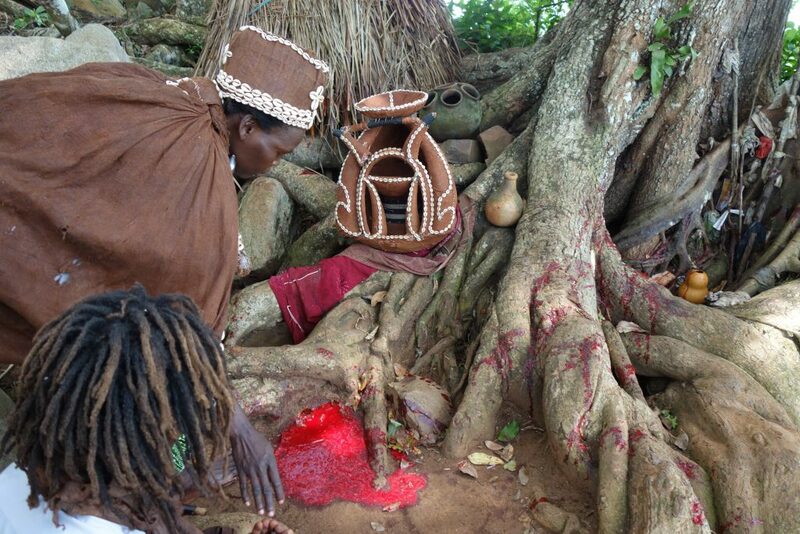 Christianity, and in particular the new churches, oppose the traditional African religion, and these healers centered around the forces of the water have often been accused of indulging in witchcraft. Thus, at the source of the Blue Nile, the water came originally from a spring where lavish sacrifices took place, but today it is part of the Christian cosmology where the River Gihon from heaven is believed to have its earthly outlet. The source of the White Nile and the successive waterfalls, on the other hand, although having an important role in Christianity today because of the religious history made by the early explorers and the later missionaries, has a whole cosmology structured around the forces of the water, which testify to the powers of the gods, but the water itself is not holy. This directs the attention to religion and water, why water works and in what ways, and what the differences are between religious waters that are neutral, sacred, and holy, all forms of water within the divine spheres. It is not to be wondered, that, in the long course the Nile makes from its source to the sea, it should have acquired a different name in every territory, where a different language was spoken; but there is one thing remarkable, that though the name in sound and letters is really different, yet the signification is the same … Among the Agows … it is called Gzeir, Geefa, Seir; the first of these names signifying God; it is also called Abba, or Ab, Father … with a fervent and unfeigned devotion, under these, or such like appellations, they pray to the Nile, or the spirit residing in that river. Water is a medium for religious and divine interaction; some water has spiritual qualities, and yet other forms of water are a distilled substance or entity of a divinity. “All around the world people have at all times attached a wide variety of religious meanings to water and the permanent uncertainties and flux of the hydrological cycle,” Terje Tvedt says. “The paradoxical natures of water – it is a life-giver and life-taker, alluring and fearsome, creator and destroyer, terrible strong and very weak, always existing and always disappearing – means that it easily can be, and often has been, ascribed all sorts of different and conflicting symbolic meanings of fundamental importance at a number of shifting levels.” Importantly, there is a fundamental ontological difference whether a river is a divinity or if a divinity transfers power to the water. There is yet another category of divine agencies; the water’s visible forces like torrential waterfalls illustrate the divinities’ powers, but the water is not holy or the power is not in the water itself. Lastly, rain comes from the divine realms, but it is neither holy nor sacred (or consecrated); but it is a gift that comes with conditions. While there is no generally accepted definition of what religion is, the problem of trying to define religion has nevertheless played a central role in developing the sociology of religion as a discipline. In 1913, Henry S. Nash struggled with defining “religion”: “To attempt in these days a definition of religion may seem like taking a wanton risk of intellectual confusion. Even a rough classification of religions is difficult. The mass of data is so vast, the varieties of religion so manifold, that no sooner has a scheme of classification been established itself than it begins to sag under the weight of material thrown upon it,” he writes. One century later, defining religion was as difficult as before, and in his 2013 book, Religion Without God, Ronald Dworkin defines religion without god. Water may dissolve some of these paradoxes such as religion with or without god, and how and why religion works. Broadly, religion can been analyzed from approaches emphasizing function or substance. Functional or pragmatic approaches see cultural phenomena as religious when some challenges or problems have divine origins and solutions, or they may be solved by direct divine intervention in one way or another. Sociologist Émile Durkheim, for instance, belongs to this category. The functional approach focuses on what problems religion can solve and what people get out of religion. Substantive approaches, on the other hand, emphasize the divine substance in whatever form. They focus on the ontological realities, like the existence of gods, divinities, and ancestors. This approach puts emphasis on rituals and the interaction between humans and the other world. Numerous scholars belong to this category, like Augustine who said that religion means “worship of God,” Edward Tylor when he defined religion as “belief in spiritual beings,” and also Otto and Eliade, among others. Although heatedly debated by scholars for more than a century, it is possible, as Kevin Schilbrack argues, to combine these two positions, not because of convenience but because it grasps the religious dimension in a better way. The use (function) and beliefs (substance) of the way water works may illustrate how functional and substantive approaches are intertwined and dependent upon each other (Fig. 5). Fig. 5. Who controls the life-giving rains – God, ancestors or spirits? Usagara, Tanzania. Image courtesy of Terje Oestigaard. In order to understand the religious role of water, it is preferable to distinguish between the “holy” and “sacred” as analytical categories. From this perspective, “holiness” refers to the divinity and what is derived from the divinity, whereas “sacredness” refers to consecrated items. Thus, there is a fundamental difference between “holy water” and “sacred water.” The holy water in Ganges in India is the Mother Goddess in Hinduism; the river is the goddess and the water is divine and her body. The water used in the Protestant baptism, on the other hand, is not a divinity, but consecrated and, hence, sacred water. Both holy and consecrated waters are within the religious realm, but the qualities and divine capacities and powers differ. Moreover, even within the category of truly holy water, or water embodying divine substance or qualities, there are differences; some waters have specific functions, whereas other types are more omnipotent and work for all kinds of purposes everywhere, or so it is often believed. Thus, with water at the center, it is possible to combine functional and substantive approaches to religion, not only from an academic perspective, but also from a religious one as perceived by the believers in faith and rituals. It is indisputable that gods and divinities are believed to work and interfere in this world among humans for better or worse, like blessing farmers and fields with the life-giving rains or penalizing sinful communities with devastating floods, so the functional approach is obviously correct on certain premises. However, these divine engagements are dependent upon the substantive approach, or one in which the gods and spirits exist and can intervene in the human world. In short, a substantial approach can exist without a functional approach (gods may choose not to engage in the human world), but a functional approach cannot work unless the spirits and divinities exist (without gods, rainmaking rituals cannot affect the weather). Compared to most other religious practices, the use of water in general and holy water in particular represents particular and peculiar paradoxes, since the most holy is often severely polluted (physically or spiritually) in ritual use. As a result, some of the holiest rivers worldwide are also the most polluted, like the holy Jordan River. However, despite the river being highly polluted, the Latin Patriarch Vicar General of Jordan explained in 2013: “There is a distinction between the physical state of water and the sacred realm. From a religious perspective it does not matter whether the water is dense or light, clear or cloudy, polluted or not polluted. This does not touch upon the aspect of faith. […] Pollution is a Western concern, it is Cartesian. Descartes’s influence stopped on the northern shores of the Mediterranean.” Another famous and highly polluted river is the holy Ganga—the very water body of the goddess herself. While polluting other holy substances or places, like an altar, is a sacrilege and a heinous sin, cosmologically speaking, polluting holy water in the right way is not, which probes to the core of the rationale and ways holy water is believed to work. Worldwide, erasing pollution and impurity—sin as a bio-moral phenomenon and substance—is the most general and omnipresent capacity of holy water. Religiously, holy water transmits purity and holiness, but in practice, this involves divine processes where the water is invested with supernatural powers transferring, transporting, and transforming impurities. Thus, in the very process of obtaining spiritual purity, devotees dispose of their impurities in the holy water either symbolically or physically. The devotees transfer the impurity to the water and the river, which transports it away—a process similar to what mundane rivers do. But if pollution and impurities were only transported away, sin and defilement would accumulate as happens with physical defilements polluting rivers. Therefore, the holiness of water and the divine agency not only accept the transference of pollution from the devotees, but the water transforms the pollution to purity. Consequently, even the most polluted holy rivers from a profane point of view are still in the religious process of transforming impurity to purity. Following this logic, holy rivers should cleanse themselves of physical pollution. If the rivers are unable to cleanse themselves, it is a sign that they have lost part of their holiness. If a river cannot transmit purity by transferring, transporting, and transforming impurities, its water is unfit for ritual practice. The holy water does not work anymore. It may still be in the realm of divinities and religious water, but it has not the qualities and capacities of functioning as holy water. While rivers like the Ganges or Jordan are highly polluted, and devotees pollute the waters spiritually and physically by their ritual activities, the source of the Blue Nile is distinctly different, although the same principles regarding holy water work at an overall level. The purity of the waters at Gish Abay has to be protected from any defilement by all means, which was also a prohibition reported by the early travellers. 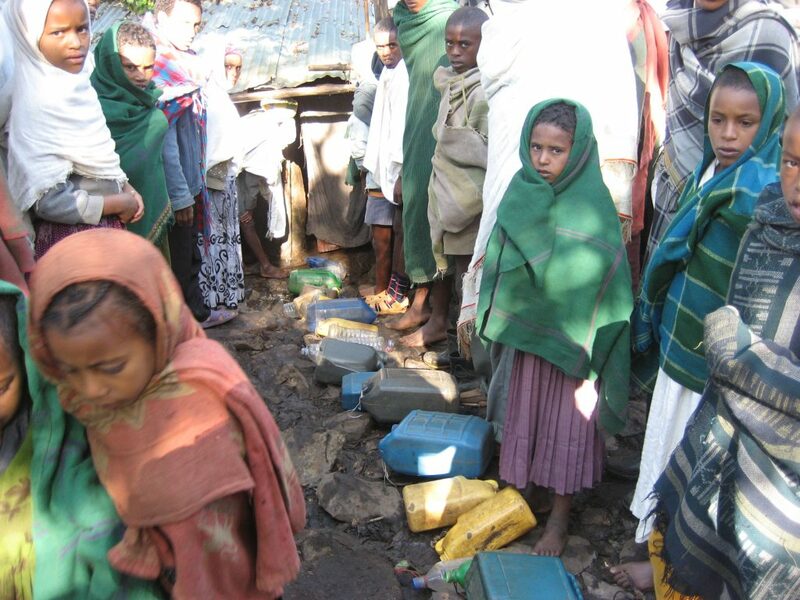 Not only have the devotees to be Ethiopian Orthodox Christians, but even the pilgrims approaching the source must be in a pure condition despite that the aim is to use the holy water to cleanse off sins and impurities. In practice, this means that devotees purify themselves by fasting the very morning they visit the source, basically eschewing breakfast or any food before the visit. Although the Gihon River is important for Muslims and Christians from other denominations, such as Protestants, these devotees are in general seen as too impure and forbidden to approach the source. Polluting the holy water coming from heaven is a triple sin. First, it will pollute God’s holy water or basically defile the divine substance before it is ritually or religiously used. Second, and as a consequence, it is offending God and therefore the Almighty will punish the sinner for doing so deliberately. In fact, to sin is to act against God and his will (and this is also a sign of free will). Lastly, and perhaps most important, desecrating the source will reduce the holiness of the water for other pilgrims, ultimately jeopardizing their purity and salvation. Since the effects of drinking and using the waters may work miracles for up to 70 generations, and severely sick patients attacked and demolished by the Devil use the water in exorcisms, the purity and holiness of the divine waters is not something to be taken lightly. The beliefs and practices at the source exemplify several structural premises of the ways holy water is believed to work in religion on a general and cross-cultural level. The water from Paradise certainly transmits purity and holiness by transferring, transporting, and transforming impurities, including chasing away Satan and his demons as well as working miracles for generations, erasing all kinds of different sins. This is truly holy water and perhaps it is difficult to get holier water in Christianity, perhaps with the exception of the waters at Lourdes in France. It is easy to understand why it has been of utmost importance to protect this holy water from impurities inflicted by, so to speak, contaminated faith; not that the water itself could not purify itself or that God could not penalize the perpetrator, but it is the source. Gish Abay is the closest one may get to heaven and it is an open connection flowing directly from paradise, and subsequently polluting the source will affect everyone downstream. If God is believed to demand protection of this one-way gate from heaven, so be it. The extreme holiness and closeness to Paradise—and by definition everything in Heaven has to be holy and eternal—illustrate another aspect that limits the use of holy water and the role and importance this water may have in the overall cosmology in a religion like Christianity. The creation water or baptism is of course important in Christianity, but holiness implies restriction and inclusiveness by exclusions. If there is one thing that characterizes life on earth and among people, following religious logic, it is that it is sinful and anything but holy. In short, holy water is like a pilgrimage sanctuary in an otherwise polluted and sinful world. Herein are also the strength and limitations of holy water in ritual practice. It is extremely efficient and practical since it can be carried away in bottles and used elsewhere, but since it is holy it cannot be omnipresent everywhere at all times; a holy world would be a kind of divine existence. This is also in line with Weber, who said the natural world of religion is differentiated,  or in the words of Hocart: “Ritual would be utterly pointless if everything were charged with power. It is based on the belief that some things have power and others have not.” The latter statement is valid for world and indigenous religions alike, and it directs the attention to the even greater encompassing and total role of water in tradition and cosmos when it is not holy. Since a holy totality on earth is not possible and holy water cannot be everywhere in this world, another alternative is that no water is holy although the water is still within the divine realms or has religious origins. Although sounding like a paradox at the outset, holiness restricts and limits the use and omnipresence of water compared to uses and beliefs of non-holy water in water cosmologies. From a human perspective here and now, an eternal life or existence is not possible because we will die. Hence, following Hocart, immortality is rather “freedom from premature death and the diseases that cause it and the renewal of this vigorous life hereafter.” Hence, it is no wonder that the healers along the Nile from the source of the White Nile are also traditional doctors employing water and medicines, given that rituals and medicines traditionally work in very much the same ways. “Ritual has appeared throughout as a method of achieving life. 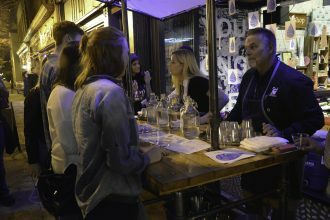 Ritual has at the bottom the same end as medicine, but medicine has a more specialized purpose,” Hocart says. “Ritual promotes life by promoting everything on which life depends: crops, cattle, children – and also what these depend on: rain and sunshine. Medicine confines itself to what directly affects the body and concentrates on curing illness.” Water, on the other hand, is more total and encompassing than anything else, and it represents and gives life to everyone. Those controlling these forces, or those who are the intermediaries between humans and gods, are hence extremely powerful. A fundamental part of African traditional religions and their cosmologies is power; neither good nor bad, but both. “Power is both spiritual and material and often explicitly so. Spiritual power is believed to lead to material power – political influence and wealth….Overall, spirit power is assumed to permeate the material world, which makes this world both something to be wary of and something that can be used in interaction with the spirits.” The source of the White Nile and the Bujagali and Itanda Waterfalls are such places where the spiritual powers are strongest, and like going to a pilgrimage site such as Gish Abay where the power is available in the form of holy water, the powerful healers are believed to enable even mightier and more powerful outcomes than the effects of the Gish water from heaven. Of course this depends on whom one asks. Thus, from one perspective it is possible to argue that one may better grasp the significance and importance of water in society and religion by emphasizing cosmologies where water is not perceived as holy if the most powerful spirits and deities are associated with or reside in different forms and types of water. As Hocart pointed out with regard to stones a long time ago, it is “the spirit in, not of a stone.” It is similar with regard to the water spirits in Bujagali Falls or Itanda Falls; they live in the water, but they are not spirits or gods of water (like Ganga in Hinduism), and the water itself is not a spirit or holy. The different and varying water-worlds matter, precisely because they are the ultimate source for all life and well-being. Hence, what matters most for believers is within the realm of god or the ancestors as perceived by the devotees. Humans, and in particular farmers, are to a large extent at the mercy of benevolent or malevolent divinities. Gods or ancestors, and in any given combination, are believed to procure the annual rains or life-giving floods, or to withhold the precious water for life as penalty for individual and communal sins. Fig. 6. Blood sacrifice to the rain-god Mesoké in the Itanda Falls. Photo: Terje Oestigaard. Jaja Bujagali is perceived to be an “archbishop” in the traditional Busoga religion, and there is literally nothing in between heaven and earth he cannot request of Budhagaali spirit, with some few exceptions. It is Mary Itanda living in the next waterfalls who may incarnate the raingod Mesoké, who also resides in these waterfalls. Although Budhagaali is the strongest and more supreme than all the other gods, including Itanda, a fundamental aspect of the water-world such as rain is the domain of another divinity and its healer as an intermediary medium. In March 2017, when a drought was announced and dried up the land with projected harvest failure and human suffering, a goat was sacrificed to the rain-god (Fig. 6). I participated in the ritual and sacrifice aiming to provide and procure the life-giving rains at the right time and in the right amount. When I was back in October conducting other fieldwork, I visited Mary Itanda, again curious to know if the rainy season had been good. She could tell that god had been very pleased with the sacrifice; Mesoké had given the good rains and society avoided a major disaster. Although commonly described as rainmaking, no human or rainmaker can make rain; the rains belong to the gods in their divine spheres. The gods can withhold the life-giving rains as penalty for sinful behaviour or bless people and land with the good rains at the right time. But people can ask their medium to request the rain-god to give the precious life-giving rains. From a functional approach to religion, one may thus identify at least two structuring parameters for the development and resilience of a rainmaking ideology. First, there has to be a variability in precipitation, and cross culturally it seems that the greater the variability the more likely it is that a rainmaking cosmology may evolve; this relates to the second aspect, namely dependency on the rain. For many urban dwellers in modern cities, rain is primarily a reason for putting on rubber shoes and using an umbrella, and life continues more or less the same whether it rains in February or July. For subsistence farmers living in dry areas, the annual rains in the right amount at the right time are a matter of life and death. Together, great variability of the life-giving waters and the total dependencies of these unpredictable rains, or the agro-water variabilities, have historically favored religious beliefs and rituals where humans engage with divinities in various ways to ensure the arrival of the precious waters, or in more general terms, wealth and health for all. The Lament of the River Nile is part of a longer oracle against Egypt. It describes a drought causing the Nile to dry up with subsequent social and political unrest, and all is seen as a consequence of a judgment of YHWH. Moreover, in the book of Deuteronomy the lands of Egypt are described as “a God-forsaken country” because of the particular ways it is watered while, in contrast, the Promised Land is hailed as a land of hills and valleys, “which drinketh water of the rain of heaven.” Israel was a country of benevolent waters. In Deuteronomy (11:10–13), it says: “The land you are about to cross into and possess, a land of hills and valleys, soaks up its water from the rains of heaven. It is a land which the Lord your God looks after, on which the Lord your God always keeps his eye, from year’s beginning to year’s end.” In fact, rain is seen as more precious than the Torah and the creation itself, following other Hebrew scriptures: “The sending of rain is an event greater than the giving of the Torah. The Torah was a joy for Israel only, but the rain gives joy to the whole world….The day of rainfall is greater than resurrection; […] than when the heaven and the earth were made.” When God intervened in the hydrological cycle as a “rain-god,” the importance and consequences were absolute encompassing everyone and everything. Or, in other words, the Almighty’s omnipotent powers impacting everyone are clearly visible for believers when the life-giving waters turn into death and decay. Religiously, as Weber points out, “rain was one of the awards promised by Yahweh to his devotees, who were at that time agriculturalists….God promised neither too scanty rain nor yet excessive precipitation or deluge.” In other words, God controls all aspects of life through water, and although this water was not holy, it was within and from the divine sphere. From this perspective, when God worked as a traditional water divinity, the true power and omnipotence were revealed when the water was not holy, but everywhere in the presence or absence of rains. Moreover, if the life-giving rains were holy water, all people and land would have been consecrated, and as a paradox, if this was the case and holy water was so available for everyone everywhere, it would have reduced the importance of water in other rituals. While the latter observation is rather theoretical, abstract or theological, the more fundamental aspects of water and religion are the always localized and specific adaptations and notions of various forms of life-giving waters, even in a world religion like Judaism or Christianity. If God penalized the Egyptians with a devastating flood, the rains had, hydrologically speaking, their origin in the “water-tower” of Africa or the Abyssinian highlands, where also Gish Abay is located—the very River Gihon flowing from Paradise. Thus, even within a river basin, along the same river and based on the same scriptures in the same religion, God may apparently withhold the rains in Ethiopia causing drought in Egypt, while at the same time the source of the Nile at Gish Abay comes from heaven (and he may send the precious rains to Israel instead). These are not contradictions or paradoxes, but rather highlighting the fundamental role of water in religion: it matters right here and now for believers, and local absences or presences and specific adaptations are cosmologically conceptualized and anchored in specific environments. Thus, with water as the axis, even transcendental religions can be located and operating in ecologies dependent upon the water-worlds controlled by the very divinities, particularly if the waters are not holy. Ordinary water in culture and nature possesses qualities behaving and transcending differently than all other elements in nature. Religious waters not only build on these inherent capacities, but add new enigmas and transformative powers. While conceptions of holy water in the Ganges or the use of water in baptism have shaped many perceptions of what holy water is and how it works in religious practices, it might be fruitful to extend the frames and go beyond an emphasis on only holy water to religious waters in general. As seen, gods, even transcendental divinities like the Christian (or Jewish) God, have historically been believed to use their waters in many different ways directly impacting human lives and livelihood for better or worse. Apart from the Deluge, God has also withheld both the rains and rivers’ inundations as penalties, but he also blessed the very same people with the precious and needed life-giving waters, not because water is holy, but because it gives lives to farmers and fields. On the other hand, the holy waters coming from Gish Abay are the closest devotees can come to collecting divine grace flowing directly from heaven. Thus, even the Christian God may use his water in a number of different ways. Some of the waters may embody inherent heavenly holiness like the water at Gish; other types are neutral waters for farms and fields, or punishing waters such as withheld rains or torrential floods (and then there is water used as torments in different layers of the Catholic hell, for instance). Omnipotent and omnipresent gods may of course control the hydrological world; in fact, controlling and using the water-world is one of the most efficient ways of manifesting power and affecting all people. Still, the gods in world religions are not rain or river-gods, and although the scriptures document interventions in the actual water world of life-giving rains and inundations, traditional indigenous religions are often better adapted to specific ecologies with all their spirits and rainmaking practices. In water-worlds where water is not holy, the omnipresence of the cosmology may thus be even greater than in religions with holy water, since holiness implies restrictions and inclusiveness. If divinities control all water everywhere, this creates a total and encompassing worldview adapted to specific ecologies. Water in general, and religious water in particular, will continue to fascinate and intrigue people. Although some of the paradoxes are possible to explain or partly analyze, it is nevertheless all the beliefs about the religious and mysterious qualities and divine powers that have made the River Nile the most legendary of all rivers in the world. Herein is also one of the fundamental characteristics and particularities of religious water; while most religious practices involve awe and different degrees of mysticism, the very water itself is very concrete, practical, and here and now. The religious waters look no different than ordinary water and hence the paradoxes of the ultimate source of life continue, because religious waters nevertheless have distinctly different origins, qualities, and powers. I would like to thank Prof. Terje Tvedt and the Satterthwaite Colloquium for fruitful discussions. Hurst, E. & Phillips, P. 1931. The Nile Basin, volume 1; general description of the basin, meteorology, topography of the White Nile Basin. Government Press, Cairo, p. 1.
 https://en.oxforddictionaries.com/definition/paradox (accessed 15 February 2018). Tvedt, T. & Oestigaard, T. 2010. A History of the Ideas of Water: Deconstructing Nature and Constructing Society. In Tvedt, T. & Oestigaard, T. (eds.). A History of Water. Series 2, Vol. 1. The Ideas of Water from Antiquity to Modern Times: 1-36. I.B. Tauris, London, p.16. Oestigaard, T. & Gedef, A. F. 2013. The Source of the Blue Nile – Water Rituals and Traditions in the Lake Tana Region. Cambridge Scholars Press. Newcastle; Oestigaard, T. 2018. The Religious Nile. Water, Ritual & Society since Ancient Egypt. I.B. Tauris, London. Lobo, J. 1789. A voyage to Abyssinia, by Father Jerome Lobo, a Portuguese Missionary. Containing the history, natural, civil, and ecclesiastical, of that remote and unfrequented country, continued down to the beginning of the eighteenth century: With fifteen dissertations … relating to the antiquities, government, religion, manners, and natural history, of Abyssina. By M. Le Grand, translated from the French by Samuel Johnson, LL.D. To which are added, various other tracts by the same author, not published by Sir John Hawkins or Mr. Stockdale. Elliot and Kay, London and C. Elliot, Edinburgh, p. 110. Johnston, H. 1903. The Nile Quest. Lawrence and Bullen, London, p. 51. Bruce, J. 1790. Travels to Discover the Source of the Nile, in the Years 1768, 1769, 1770, 1771, 1772, and 1773 in Five Volumes. J. Ruthven, London, Vol. 3: 633. Speke, J. H. 1863. Journal of the Discovery of the Source of the White Nile. Blackwood and Sons, Edinburgh and London, p. 467. Speke, J. H. 1864. What Led to the Discovery of the Source of the Nile. Blackwood and Sons, Edinburgh and London, p. 469, 259. Nwauwa, A. O. 2000. The Europeans in Africa: Prelude to Colonialism. In Falola, T. (ed.). Africa. Volume 2. African Cultures and Societies before 1888: 303-318. Carolina Academic Press, Durham, p. 304. Mockler-Ferryman, A. F. 1903. 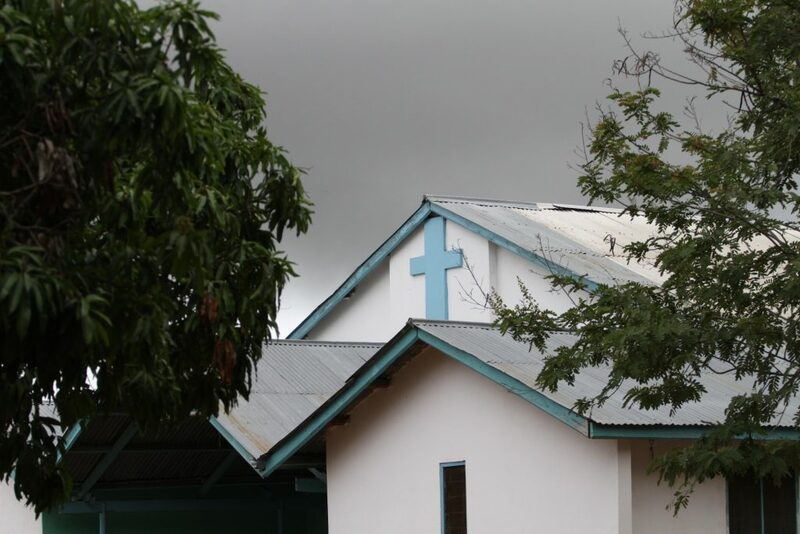 Christianity in Uganda. Journal of the Royal African Society, Vol. 2, No. 7: 276-291. Oestigaard, T. 2018. Waterfalls and moving waters: the unnatural natural and flows of cosmic forces. In Day, J. & Skeates, R. (eds.). Routledge Handbook of Sensory Archaeology. Routledge, London. Lindsay, J. 1968. Men and Gods on the Roman Nile. Frederick Muller Ltd., London, p. 1. Seneca, n.d. Seneca in ten volumes. VII. Naturales quaestiones. I. with an English translation by T. H. Corcoran. William Heinemann Ltd. London, MCMLXXI, 3.1.2, p. 213. Bruce, J. 1790. Travels to Discover the Source of the Nile, Vol. 3: 654-5. Dawson, C. 1957. The Dynamics of World History. Sheed and Ward, London, p. 128. Turner, V. 1975. Revelation and divination in Ndembu ritual. Cornell University Press, Cornell, p. 21. Eliade, M. 1993. Patterns in Comparative Religion. Sheed and Ward Ltd., London, p. 193. Tvedt, T. 2016. Water and Society – Changing Perceptions of Societal and Historical Development. I.B. Tauris, London, p. 65. Tvedt, T. 2016. Water and Society, p. 72. Parsons, T. 1944. The theoretical development of the sociology of religion: a chapter in the history of modern social science. Journal of the History of Ideas, Vol. 5, No. 2: 176–90. Nash, H. S. 1913. The Nature and Definition of Religion. The Harvard Theological Review, Vol. 6, No. 1: 1-30, p. 1. Dworkin, R. 2013. Religion Without God. Harvard University Press, Cambridge, p. 1. Augustine. n.d. Saint Augustine. The City of God Against the Pagans, with an English translation by G. E. McCracken, in seven volumes. William Heinemann Ltd, London. MCMLVII. Schilbrack, K. 2014. Philosophy and the Study of Religions. A Manifesto. Wiley-Blackwell, Oxford. Oxtoby, W. G. 1987. Holy, Idea of the. In M. Eliade (ed.). The Encyclopaedia of Religion. Vol. 6: 431-8. MacMillian, New York, p. 434. Châtel, F. 2014. Baptism in the Jordan River: Immersing in a Contested Transboundary Watercourse. WIRES Water, 1: 219-227. DOI: 10.1002/wat2.1013, p. 225. Parry, J. 1994. Death in Banares. Cambridge University Press, Cambridge. Oestigaard, T. 2017. Holy water: the works of water in defining and understanding holiness. WIREs Water 2017. doi: 10.1002/wat2.1205. Bruce fn. 7; Beke, C. T. 1844. Abyssinia: Being a Continuation of Routes in That Country. Journal of the Royal Geographical Society of London, Vol. 14: 1-76; Cheesman, R. E. 1935. Lake Tana and Its Island. Geographical Journal, Vol. 71, No. 4: 489-502; Cheesman, R. E. 1968 . Lake Tana and the Blue Nile. An Abyssinian Quest. Frank Cass, London. Hertz, R. 1996. Sin and expiation in primitive societies. Occasional papers No. 2. British Centre for Durkheimian Studies, Oxford. Oestigaard, T. 2013. Water, Christianity and the Rise of Capitalism. I.B. Tauris, London. Weber, M. 1964. The Sociology of Religion. Beacon Press, Boston. Hocart, A. M. 1954. Social Origins. Watts & Co., London, p. 31. Hocart, A. M. 1968. Caste. A Comparative Study. Russel & Russel, New York, p. 18. Hocart 1954. Social Origins, p. 123. Wlodarczyk, N. 2013. African Traditional Religion and Violence. In Juergensmeyer, M. Kitt, M. & Jerryson, M. (eds.). The Oxford Handbook of Religion and Violence: 153-166, p. 157. Hocart 1954. Social Origins, p. 30. Sanders, T. 2008. Beyond Bodies. Rainmaking and Sense Making in Tanzania. Toronto University Press, Toronto, p. xiii, 3. Tvedt, T. & Oestigaard, T. (eds.). 2016. A History of Water, Series 3, Vol. 3. Water and Food: From hunter-gatherers to global production in Africa. I.B. Tauris, London. Marlow, H. 2007. The Lament over the River Nile: Isaiah XIX 5-10 in its Wider Context. Vetus Testamentum, Vol. 57, Fasc. 2: 229-242. Châtel, F. 2010. Bathing in Divine Waters: Water and Purity in Judaism and Islam. In Tvedt, T. & Oestigaard, T. (eds.). A History of Water. Series 2, Vol. 1. Ideas of Water from Antiquity to Modern Times: 273-297 I.B. Tauris, London, p. 274. Isaacs, R. H. 1998. The Jewish Sourcebook on the Environment and Ecology. Jason Aronson Inc., Northvale, NJ, p. 159. Weber, M. 1964. The Sociology of Religion. Beacon Press, Boston, p. 57. Oestigaard, Terje. 2018. “The Sources of the Nile and Paradoxes of Religious Waters.” Open Rivers: Rethinking Water, Place & Community, no. 11. http://editions.lib.umn.edu/openrivers/article/the-sources-of-the-nile-and-paradoxes-of-religious-waters/. Download PDF of The Sources of the Nile and Paradoxes of Religious Waters by Terje Oestigaard. Terje Oestigaard is a Senior Researcher in the Nordic Africa Institute, Uppsala, Sweden, and a Docent in the Department of Archaeology and Ancient History, Uppsala University. His recent book is The Religious Nile. Water, Ritual and Society since Ancient Egypt (I.B.Tauris, 2018). When I heard about the Nobel Peace Prize Forum’s 2018 focus on “The Paradox of Water,” I hoped for a connection between our journal and the perspectives that speakers would bring to the gathering. Here, thanks to a great deal of hard work by many people, not least Augsburg political scientist Joseph B. Underhill, is the result: a collection of features and columns that explores some of the many paradoxes of water. 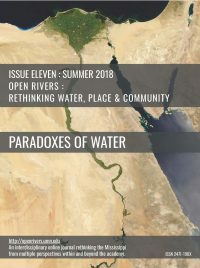 This issue of Open Rivers, anticipating and drawing on the upcoming Nobel Peace Prize Forum in Minneapolis, explores the complex intertwining and paradoxes of water, conflict, and peace. Anything so fundamental and complex as water or peace must, of necessity, contain seemingly contradictory or opposite qualities. The beauty of water is in how it reconciles and provides space for those complex, muddy mixes of qualities and characteristics. These videos and audios are from Bdote Memory Map. The deep mapping project created by Allies: media/art is a partnership project with the Minnesota Humanities Center. The website was created several years ago to help citizens of the area now called Minnesota know where they are, and to learn from the Dakota that this place and the river is not a resource, but rather a relative. 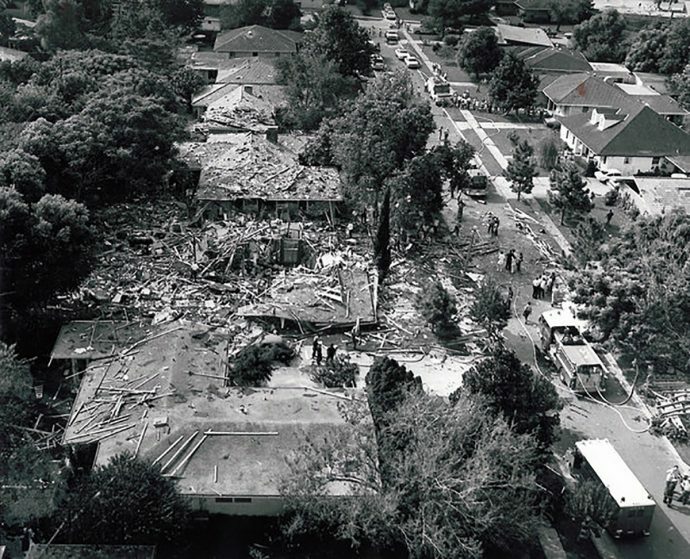 Early one September morning in 1975, in a quiet Metairie subdivision west of Transcontinental Drive, a ranch house suddenly exploded in a fireball so powerful it damaged 20 neighboring buildings and broke windows a mile away. The house plus four adjacent homes were reduced to rubble, and 11 people were seriously injured. Water is at the core of sustaining all life on earth, and the people who have inhabited the arid and semi-arid lands of the Middle East and North Africa (MENA) region throughout the centuries know this very well. Scarcity of water in the region has shaped its history and geopolitics, including into the present day, with climate change and population growth putting more pressure on already scarce water resources (World Bank 2018). We live on a water planet. As the writer Arthur C. Clark noted, if we didn’t happen to be land-dwelling creatures, we would call our planet Ocean, rather than Earth. And for humans, fresh water is critical for life, health, our economies, and vibrant ecosystems. The vast majority of water on the planet—more than 97 percent—is salt water, in our oceans. Heraclitus of Ephesus (535 BCE-475 BCE) was the master of paradox: "It rests by changing," "a thing agrees at variance with itself," and “the same: living and dead, and the waking and the sleeping, and the young and the old” (Kahn 1979, Fragments LII, LXXVIII, XCIII). Both Plato and Aristotle saw his views as logically incoherent and inconsistent with the law of non-contradiction. The River Nile has long been a subject of study and veneration. From the earliest times the Nile has presented problems upon which men have speculated. "Two of the most important which have been discussed since the time of Herodotus, the position of the sources of the Nile and the origin of its annual flood, were solved during the last and at the beginning of the present century." What does the river say to you? This is the core question posed by Write to the River, a creative writing project that I launched in partnership with the Twin Cities nonprofit Friends of the Mississippi River and photographer Tom Reiter, in spring 2017. Questions about water are often implicitly about systems of power. The benefits and impacts of how water is used, distributed, and accessed are unevenly distributed. Water thus becomes a site where the inequalities in society are made visible and contestation arises. The readings listed here offer a sample of some of the ways water is implicated in systems of inequality and work toward social justice. Almost 500 river miles below its source at Lake Itasca, the Mississippi River tumbles over its only waterfall in downtown Minneapolis. Dubbed the Falls of Saint Anthony by explorer Father Louis Hennepin, the falls were formed by glacial action more than 10,000 years ago. The magnificent waterfall was once over 200 feet high and located in downtown St. Paul. Over the years, the falls migrated upstream to their present location in downtown Minneapolis. In December of 2016, I went on the journey of a lifetime to kwaZulu-Natal, South Africa on a faculty-led excursion titled “Summits to Sea” with Virginia Commonwealth University (VCU). Along with nine other students and two faculty members, we traversed across South Africa from the source of the great rivers in the Drakensburg Mountains all the way to their opening in the Indian Ocean. For three weeks, we hiked, swam, and kayaked our way through the various water systems that affect the economy, ecology, and public health in South Africa. A dominant narrative in media today tells us that American society is full of juxtaposition and conflict: rural v. urban, rich v. poor, black v. white, conservative v. liberal. We might get the impression that we must stick to our own in-group in order to feel safe and heard. And yet, there is an issue central to life as a Minnesotan regardless of how you identify or with whom you spend your time. That issue—clean water— is a necessity for life and good health. The Minnesota National River and Recreation Area (MNRRA) is a 72-mile National Park Service unit along the Mississippi River as it flows through the Twin Cities of Minneapolis and St. Paul. MNRRA is an open secret in the Twin Cities, and it is not widely known as a national park, even by people who live and work within its borders. 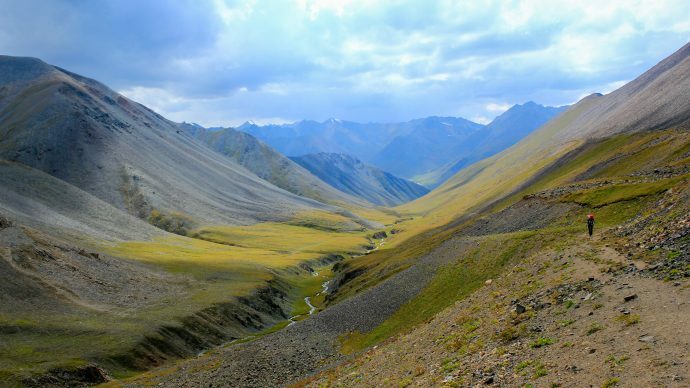 Welcome to Issue 9 of Open Rivers, which begins our third year of publication! Our tagline, “Rethinking Water, Place & Community,” speaks to our sense that there is a conversation taking place in diverse professional sectors and academic disciplines about the relationships between our human communities and our water communities, and that there is an audience for this conversation, both on campus and in the broader water-oriented professional community.